Hello everyone, we’ve all made it to T.G.I.F. Day, thanks for being here Friday and for showing up on time. I hope you all are having a fun Friday and are getting ready for a fun weekend. I think we’re going to have another busy one since the Dad will be moving The Cat Blogosphere to our new host. If you are a cat blogger and don’t visit The Cat Blogosphere daily and share your link you need to start, some fun things will be happening there. Hey, yesterday I told you that I got to try a new food. What did I really think about it? That’s my T.G.I.F. for today…Tasty Good Is Fun! Yes, it really was that good. The Dad ordered some more so I’ll continue to like it at least until it gets stocked up. Isn’t that usually the case? Have a fun Friday everyone and stop by and visit with Sister Seal tomorrow for Sister Saturday. Remember, adopt cats, we deserve it!!!!! More Forever Homes More Often! Purrrrr! Zip! Later! adopt cats, Brian, T.G.I.F. adopt cats, brian, T.G.I.F. “Like it until it gets stocked up”: Something most cat humans can relate to this😄! I’m really excited about all the good stuff that is happening at the Cat Blogosphere! haha yep, that sure seems to be the case. That does look like yummy food Brian.Maybe Zoey will eat some. You all have a great day. Well if dad took that pic after you ate then I would say it must have been good you are still licking those lips! YUM. OMC, that is Caroline to a T. She’ll like a food, Mom will buy a bunch, then Caroline turns up her nose. Then we have to hear the “cat food doesn’t grow on trees, you know” speech. Yes indeedy love it until Dad gets 87 cans then all of a sudden decide it is nasty. That is what we felines do! 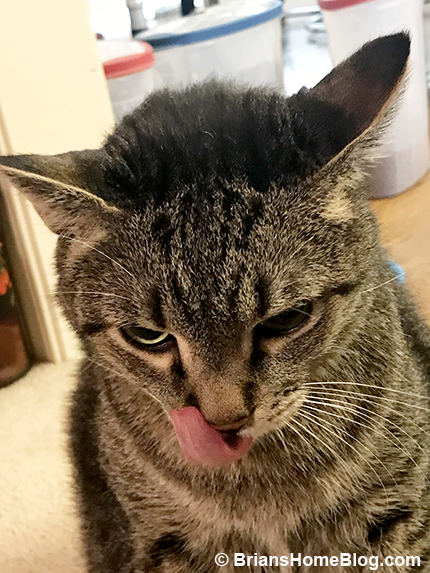 Nice photo of you licking your chops, Brian! Friday took a long time to get here this week, dontcha think? I so remember my kitties liking a particular kind of food until I stocked up that food and then they wouldn’t eat it anymore. It’s the way of cats. We think it might be fun to switch up our food every now and then, but the Momster says it takes time to do that with us. Some of us don’t do well with change in our diet, so a change in food means adding a few new kibbles at a time. That’s OK, we like what we are getting now and our vet says it is a great food. Too cute! A cat wandered into our yard today and I’d like to get him checked out and neutered, if not flat out adopt him. Wish me luck. I wasn’t prepared to handle taken in a possibly diseased animal, though he looked well, and don’t know where he is now. ~sigh~ Be well. And have a lovely weekend. The Cat Blogosphere is really shaping up! It’s getting very exciting! That is one great tongue pic, Brian! Trying new food is always fun. When there is lots of it, turn your nose up and walk away. No one wants a food that’s common as dirt. Hi, Brian. What a cute shot of you! How nice you got a new and yummy food and you’ll be stocked up! I can see you really enjoyed that food. I feel the same way about watermelon, Brian, sometimes that’s all I want and I could eat it all day and then there’s half a one taking up precious fridge space. A new good food is allus great! You make me laugh, Brian! Of course, you’ll love it until he gets a great big supply – and then you’ll change your mind. Our dogs do that too! TeeHeeHee…We are glad you like your new foodies, Brian…..for now ;-). The case is when there’s a case in the house, I won’t even sniff it. Wow, you have quite a long tongue!